Our Abpromise guarantee covers the use of ab55445 in the following tested applications. Genetic variations in MIF are associated with susceptibility to rheumatoid arthritis systemic juvenile (RASJ) [MIM:604302]. An inflammatory articular disorder with systemic-onset beginning before the age of 16. It represents a subgroup of juvenile arthritis associated with severe extraarticular features and occasionally fatal complications. During active phases of the disorder, patients display a typical daily spiking fever, an evanescent macular rash, lymphadenopathy, hepatosplenomegaly, serositis, myalgia and arthritis. Belongs to the MIF family. Secreted. Cytoplasm. Does not have a cleavable signal sequence and is secreted via a specialized, non-classical pathway. Secreted by macrophages upon stimulation by bacterial lipopolysaccharide (LPS), or by M.tuberculosis antigens. MIF antibody (ab55445) used in immunohistochemistry at 5ug/ml on formalin fixed and paraffin embedded human lung, adenosqumous cell carcinoma tissue. Overlay histogram showing Jurkat cells stained with ab55445 (red line). The cells were fixed with 80% methanol (5 min) and then permeabilized with 0.1% PBS-Tween for 20 min. The cells were then incubated in 1x PBS / 10% normal goat serum / 0.3M glycine to block non-specific protein-protein interactions. 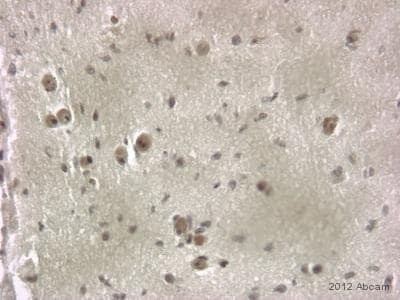 The cells were then incubated with the antibody (ab55445, 1µg/1x106 cells) for 30 min at 22ºC. The secondary antibody used was DyLight® 488 goat anti-mouse IgG (H+L) (ab96879) at 1/500 dilution for 30 min at 22ºC. Isotype control antibody (black line) was mouse IgG1 [ICIGG1] (ab91353, 2µg/1x106 cells ) used under the same conditions. Acquisition of >5,000 events was performed. 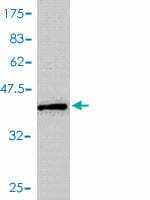 This antibody gave a positive signal in Jurkat cells fixed with 4% paraformaldehyde (10 min)/permeabilized in 0.1% PBS-Tween used under the same conditions. Immunohistochemistry (Formalin/PFA-fixed paraffin-embedded sections) - Anti-MIF antibody (ab55445)Image from Li J et al., J Biol Chem. 2012 Oct 12;287(42):35484-95. doi: 10.1074/jbc.M112.367532. Epub 2012 Aug 14.Fig 7.; October 12, 2012 The Journal of Biological Chemistry, 287, 35484-35495. Immunohistochemical analysis of Human nasopharyngeal carcinoma, staining MIF with ab55445 at 1/100 dilution. Publishing research using ab55445? Please let us know so that we can cite the reference in this datasheet. Hello,I have a question about one of your products. I have ananti-mif antibody(ab55445), andIneed to knowwhat is the code in your catalog for the specific positive control for thisantibody. Ineed tobuy this product, I live in Venezuela. Thank you very much for contacting us with your enquiry. The antibody was also tested with Jurkat cells in flow cytometry, but we do not sell cell lines at this time. 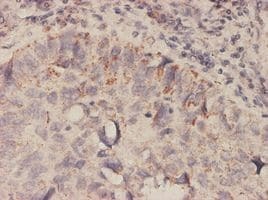 I would like to test ab55445 on Human tissue in IHC-Fr. DISCOUNT CODE: Expiration date: I am very pleased to hear you would like to accept our offer and test ab55445 in IHC-FR on human tissue. This code will give you 1 free PRIMARY ANTIBODY before the expiration date. To redeem this offer, please submit an Abreview for IHC-FRand include this code in the “Additional Comments” section so we know the Abreview is for this promotion. For more information on how to submit an Abreview, please visit the site: www.abcam.com/Abreviews. Remember, we publish both positive and negative Abreviews on our datasheets so please submit the results of your tests. The code will be active once the Abreview has been submitted and can be redeemed in one of the following ways: 1) Call to place your order and mention the code to our customer service department; 2) Include the code in your fax order; 3) Place your order on the web and enter the promotional code. Any feedback that you can provide will be greatly appreciated, whether positive or negative. If you have any further questions, please do not hesitate to contact us. We look forward to receiving your Abreview and wish you luck with your research. The terms and conditions applicable to this offer can be found here: www.abcam.com/collaborationdiscount.